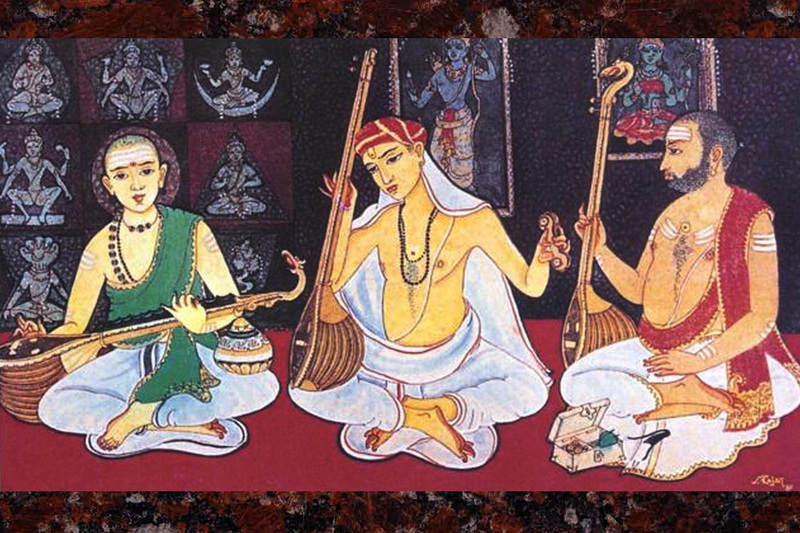 Although there are a great many well known composers of Carnatic music, it is customary to think of them as being pre and post “Trinity” which is the term by which Tyagaraja, Muthuswami Dikshitar and Syama Sastri have collectively come to be known. Purandara Dasa (1491–1564) is known as the father (Pitamaha) of Carnatic music because of his pioneering contributions. Purandara Dasa is known for formulating the basic lessons of Carnatic music. He structured graded exercises known as Swaravalis and Alankaras and introduced the Raga Mayamalavagowla as the first scale to be learned by beginners. He also composed many simple Gitams (songs) till which are taught to students to the present day. The contemporaries Tyagaraja (1759? – 1847), Muthuswami Dikshitar, (1776–1827) and Syama Sastri, (1762–1827) are regarded as the Trinity of Carnatic music because of the quality of their compositions and the influence they had on the development and performance of Carnatic music. Being contemporaries, they have met and have even collaborated. The influence of royal patronage, history and culture led to Telugu and Sanskrit being the main languages for their compositions. Through the influence of the powerful and evocative poetry in their music, Carnatic Music came to be primarily a vocal music form and instrumentalists play the same compositions that are sung by vocalists. There is not a separate tradition of composing instrumental music. Composers of Carnatic music were usually scholars proficient in one or more of the languages Kannada, Malayalam, Sanskrit, Tamil and Telugu. They usually included a signature, called a mudra, in their compositions. For example, all songs by Tyagaraja (who composed in Telugu) have the word Tyagaraja in them, all songs by Muthuswami Dikshitar (who composed in Sanskrit) have the words Guruguha in them, songs by Syama Sastri (who composed in Telugu) have the words Syama Krishna in them, while Purandaradasa, who composed in Kannada, used the signature Purandara Vittala. Gopalakrishna Bharathi used the signature Gopalakrishnan and composed in Tamil. Papanasam Sivan, also composed in Tamil as well as Sanskrit, and used the signature Ramadasan. Due to the absence of complete historical records and manuscripts, there is some measure of controversy surrounding the dates and numbers of compositions attributed to the Trinity and pre-trinity era composers. There is also controversy and disagreement about the authenticity of certain compositions attributed to these composers. The dates and the numbers of compositions in the table below cannot be easily verified. These composers lived during the time of the Trinity and there are recorded instances of their interaction with the Trinity. In addition to the above composers, various Bhakti saints of medieval India also composed devotional hymns, verses and songs. These compositions, though strictly not of Carnatic or classical character, have contributed to the gradual evolution of the Carnatic musical tradition over the centuries. the Bhakti movement continued to be a strong influence in Carnatic music through the ages and to this day; both in compositions and in performance. Much of this content is provided or derived from Wikipedia. The text is available under the Creative Commons Attribution-Share Alike License .